In some cases, the best way to resign from your job is by sending an email resignation message. If it's possible, it is most appropriate to resign from your job by telling your boss in-person. However, in some cases, it's not feasible. For example, if you have a remote position or your boss works in another city or country, you might not be able to resign in person. In this case, you might decide to announce you are quitting your job through email. That’s perfectly acceptable, if providing notice in-person isn’t possible. If you need to resign via email, be sure your email message is polite and professional, and includes all the pertinent information related to your resignation. You’ll need to specify how much notice you are giving and when your last day of work will be. You should also inquire about the status of employee benefits you may be entitled to upon termination of employment. This way, you can leave your job on a positive note. After all, you never know when you’ll need to ask for a letter of reference from your former employer. Your boss will be more likely to help you out if your resignation was thoughtful and professional. Go ahead and review some advice on writing a professional email resigning from a job, along with examples of email messages to use to quit your job. Give two weeks' notice. If possible, give your employer the standard two weeks' notice when you are going to quit. If that is impossible, give the employer as much notice as you can. This will help you maintain a good relationship with your former employer. Use a clear email subject line. Use a simple and direct email subject line, such as “Resignation – Your Name.” This way, your employer will know right away what your message is about. You want him or her to open and read the email as soon as possible. State the date you plan on leaving. In the email, include the date you plan to leave the company. This will give your employer a clear sense of your timeline. Don’t go into details. You do not need to give details on why you are leaving, or what you will be doing next. If you want to give a short explanation, you can. For example, you might say you are leaving due to family circumstances, a change in your career, or because you are going to graduate school. However, if you are simply leaving for another job, you probably don’t want to mention it. No matter what, keep your explanation briefand positive. Express gratitude. This is a good chance to give thanks for the time you spent at the company. However, if you were unhappy with the company, do not complain or say anything negative in your email. You want to maintain a good relationship with the employer; you never know when your paths will cross again. Offer assistance. If you are able to do so, offer to help the company with the transition. For example, you might offer to train a new employee during your final working days and/or be available to answer questions for a week or two after your departure." Ask questions. This is also an opportunity to ask questions about compensation or benefits, such as where or when you will receive your last paycheck. You should send the email to both your employer and to the human resources office. Human resources will be able to answer these types of questions. Provide contact information. Include any non-company email address or other form of contact information that you want to share, so that your employer can get in touch with you. This is especially important if you are leaving right away. Proofread the email before you send it.You want to catch any grammatical and spelling mistakes, of course, so it’s a good idea to proofread your email before you send it. Make sure your tone is neutral or friendly and that you haven’t said anything that could cause problems for you later. You might ask a friend or family member to read it over as well, just to double-check your tone (and to check for any remaining errors). It can be helpful to review a few resignation email samples before you write your resignation email. These are especially useful if you’re currently feeling emotional about the situation, and want to make sure you use a neutral tone. A sample can help you decide what kind of content you should include, as well as how to format your letter. Resignation email templates can also be very usefulto help you with the layout of your email, such as showingyou how to organize different sections of your message. You can also check out some sample email farewell messages to see how you might write an email to your colleagues announcing that you are leaving. 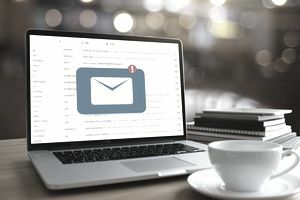 While email samples and templates are great starting points for your own message, you should always tailor a message to fit your audience and your personal circumstances. I write to inform you that I am resigning from my position here as Associate Editor. My last day will be August 7. Thank you so much for all of the opportunities this company has provided me. I have learned so much these past three years, and will never forget the kindness of all of my colleagues. Let me know if there is anything I can do to make this transition easier. You can always contact me at firstname.lastname@email.com or 555-555-5555. Thank you again for your years of support and encouragement. Please accept this message as my formal resignation from Company XYZ. My final day will be March 15, two weeks from today. Family circumstances currently require my full time and attention. Please let me know how I can be of assistance during this transition. I am so grateful for my five years at this company, and will look back fondly on the support and kindness I received from management and colleagues. Thank you again, and I look forward to staying in touch. Begin your email by clearly stating that you are resigning and include the date when your resignation is effective. You might very briefly explain why you are resigning as well. For example, you might state that you are leaving for personal reasons, you are returning to school, or you have decided to change your career path. Don’t go into detail if you have a new job, however. This (optional) section of your resignation email message should thank your employer for the opportunities you have had while employed by the company. In this section (also optional), offer to assist with the transition. You might offer something specific, such as training a new employee, or offering to be available via email for a week or two after you leave. Otherwise, just provide a general offer to help. Conclude by providing your non-work contact information so that you can stay in touch with your employer after you leave. You can either put this in your final paragraph, or include it in your email signature.